This 2 or 3 piece quilt set will keep your room looking great. Heavy enough to keep your warm, but light enough for a nice summer night. The picture posted makes the quilt look bright but the actual item is dull and unattractive. The colors sort of bled together making the design almost unrecognizable. The colors are very dull not bright and cheerful like the picture. I'm keeping it because I don't want to pay return postage and I needed a quilt and they sent the wrong one to begin with and I had to wait for a replacement so I will just settle for this unattractive one. Wish I had purchased it from a site that doesn't make you pay return postage for an item that is not described correctly. Colors exactly like photo. Very pretty design, but for the price I would've liked it to be better quality. Very thin. I'm curious to see how it'll hold up after washing it. The colors are great, but it is not really a quilt. The design is printed on the fabric; not pieces of fabric sewn on top of other pieces. Love this comforter set with bright colors and fan design. I have it in a guest bedroom and it brightens up the area. Easy to wash and looks great after cleaning. Would definitely recommend this to a friend. The colors of the quilt and sham were nice and looked the same as the picture. It was thinner than I'd expected, but was well made and fit the bed nicely. The quilt was plenty big, it hung lower than the box spring The set was a good deal coming with a pillow sham. .I only got one sham as I bought the twin size, which was expected. 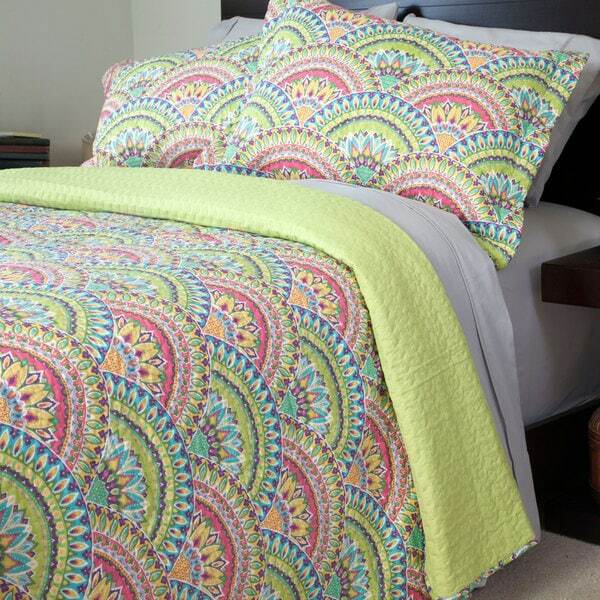 This quilt set is very colorful and will brighten up any room. It is light weight and I am so happy that I made the purchase. Nice quilt, but color was a little much for me. Nice for extra bedroom. Very soft and comfortable someone else might like it, I just didn't care for the colors. Nice Shams came with it. Might give as a gift. Christmas is coming. Pretty colors but I didn’t realize it was not cotton so I don’t know how well it will wear. Nice material, wish it provided more warmth. But good product to use during the summer. So perfect on my twin beds. Looks great with my grey walls. I wouldn't call it reversible. The underside is a neon green polyester type fabric. But I have really enjoyed this quilt in my guest room. It washed up really well. Purchased it for my niece. It can be reversed if you choose - just be aware that the printed side is boarded around the perimeter. It is a beautiful quilt set. My 11 year old niece is very happy with it. Love light colorful quilts and a good bargain! !